Porsche's preparations for their return to Le Mans are not only on the track and in the paddock. 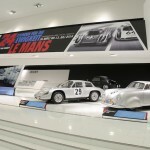 The Porsche Museum in Stuttgart-Zuffenhausen just opened a comprehensive special exhibition, running to July 13, 2014, that takes a look back at Porsche's history at Le Mans. 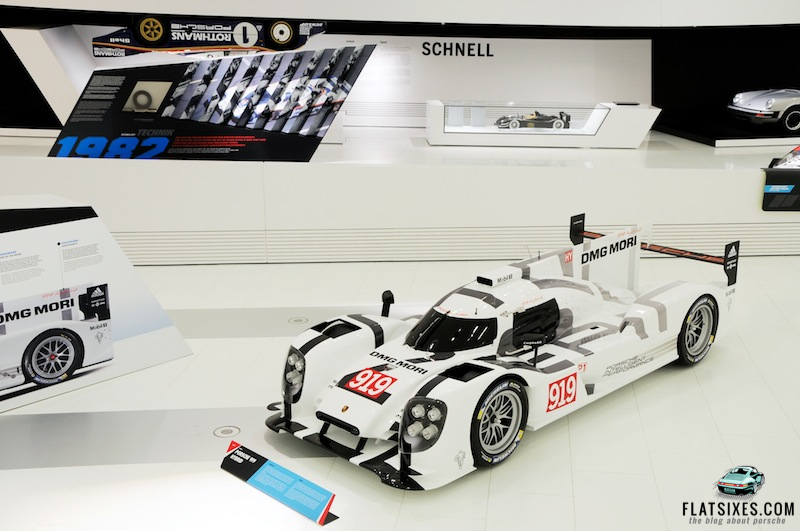 For the first time, the Porsche 919 Hybrid will be presented to the public at the Porsche Museum. Transformed to look like the famous race track where the 24 Hours of Le Mans is held, the exhibition pays homage to the famous endurance race. Your trip back in history starts in 1951 and marks the beginning of the "24 Hours for Eternity" special exhibition. Lining the walls and guiding visitors through the exhibit are re-enactments of racing situations from the Porsche's victorious racing years on life-sized wall art and track sections. More than 20 different racecars tell Porsche's unique and exciting history of this legendary 24-hour race. Alongside the 919 Hybrid, the 1969 Porsche 908/2 Spyder long tail, the 1971 Porsche 911 T/R, the 1974 Porsche 911 3.0 RSR as well as the 1981 Porsche 936/81 Spyder, and many more, will be on display for the first time at the Porsche Museum. Don't forget to check out the Porsche 936 that won in 1976 and 1977 reaching a top speed of 223 mph, the fastest vehicle in the field on the Mulsanne straight. Other Porsches on display include the 1979 Porsche 935, the Porsche 911 GT2 Le Mans, the 1994 Porsche 962 GT Dauer Le Mans as well as the WSC LMP1 of 1998. With the 962 GT Dauer Le Mans, Porsche competed in the 24-hour race under the direction of the Joest team in 1994. With this car, Mauro Baldi, Yannick Dalmas and Hurley Haywood took home the 13th overall win for Porsche. In addition to the cars, various historical and technological small exhibit pieces such as helmets, a brake disc from the Porsche 956 and the diary of Ferry Porsche, from the collection of the Porsche corporate archive, complete the historical journey of Porsche at Le Mans. On the weekend of the race, the Porsche Museum will be open ffor more than 24 hours straight, from Saturday, June 14, starting at 9:00 a.m., until Sunday, June 15, 6:00 p.m. Visitors and fans of the endurance race can follow the race live as part of a public viewing program on several monitors inside and around the museum building. Entrance is free of charge on this racing weekend.